TOKYO, Apr 11, 2019 - (JCN Newswire) - Mitsubishi Heavy Industries Machine Tool Co., Ltd. (MAT), a group company of Mitsubishi Heavy Industries, Ltd. (MHI) based in Japan, is ramping up its proposals of high-precision gear manufacturing systems for the Chinese market. As part of this initiative, MAT will be showing its integrated gear machining systems at "CIMT 2019: The 16th China International Machine Tool Show" being held in Beijing from April 15 through 20. The focus of MAT's exhibit will be the "ZE26C," a gear grinding machine capable of suppressing final gear-tooth shape error to 1μm. 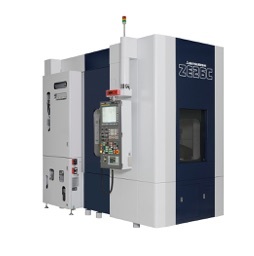 The ZE26C will respond to needs for higher speed and precision especially in the transmission systems of electric vehicles and the reduction gears used in robots. This will be the first time MAT is exhibiting the ZE26C at an industry event of this kind.